Why should people care about marine mammal health? Regardless of where we live, our world is connected to the ocean - in essence, we are all marine mammals. Because our worlds overlap, human health is forever linked to ocean health. Did you know that our oceans generate most of our oxygen, regulate our climate, and directly provide a critical food source for much of our population? We cannot prosper if our oceans do not prosper too. 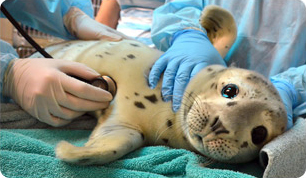 Approximately 11% of patients at The Marine Mammal Center suffer from the negative effects of humans, many of them ocean trash related. Many more suffer from the long term effects of global pollution. Learn more about what we can do at home, sign up for email updates, take a pledge to Stop Trashing our Oceans, personally fundraise for seals and write to your local and state leaders to urge positive environmental policy change. Only together can we make a positive change to the health of our oceans, and with it, our own health. And it is easy to make simple changes to improve and protect your life as well as the life of our planet. Get patient stories, the latest research insights, retail offers, event invites and more! Once you sign up, you can decide how much email you get from us - instructions to access your online profile will be sent in an email. Follow these helpful tips to find ways to help reduce the trash in our oceans and help the marine environment. Just a few simple steps can go a long way when we all chip in to make a difference! Create your own personal fundraising page for any occasion and help The Marine Mammal Center care for sick, injured, or entangled seals and sea lions! See our Awareness Campaigns here.